Feta style cheese has been know throughout history from the Byzantine Empire, and globally from Russia through the Middle East, through to Egypt and Sudan, also throughout Balkan Europe and Greece. Feta is a protected designation of origin product by the European Union, and refers to the cheese made in Greece, although many countries have vied for recognition as the origin, particularly Bulgaria and Denmark. Feta is produced using only whole sheep’s milk, or a blend of sheep’s and goat’s milk (with a maximum of 30% goat’s milk). Once the cheese is made, it is left salted for several days, then matured in brine at room temperature, then refrigerated for two months. 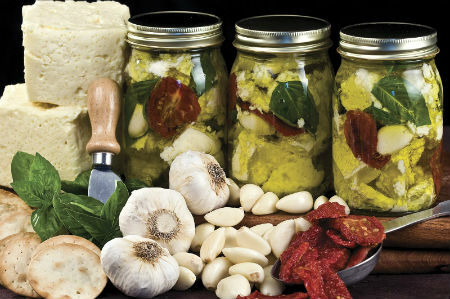 Feta is tangy and salty, ranging from mild to sharp in flavor. You can read more about feta cheese on The Daily Apple which includes a link to a ‘How to make’ recipe . While principally a salad cheese, famous as a Greek Salad, feta can be used as a filler in pastries, in omelettes and on pizza. It is also great on a cheese board as cheese, or grilled or baked in any number of ways.